Thiru Moghur is one of the 108 divya desams situated very near to Madurai. Legend has it that Lord Indra and the other Devas were cursed they were at the risk of losing their wealth and power to the Asuras and sought the help of Lord Vishnu. Maha Vishnu suggested that they along with the Asuras churn the 'par kadal' to extract the Amirtham (nectar of eternal life). At this point, the first thing to come of the churning was the "Kaala Khoota Visham" ( a deadly poison). To protect the devas from consuming this dreadful poison, Lord Shiva came and swallowed it. His consort Parvathi panicked and she clutched Shivas throat to prevent the poison from getting down his throat. The poison stagnated at Shivas throat and thus we can see his throat being blue. That is also the reason that he got the name as "Neela Kandan" ( Neela - means blue and Kandan -the neck). Apart from the Amirtham , a lot of other goodies came out of the par kadal. Among other things a horse by named "Ucchai Siravaran", the Kaama dhenu,the wealth giving cow, Iyaravadha elephant,which became the Vaahanam (Vehicle) of Indiran, Kousthuvamani,the tree Karpaga Virutsham, the tree that grants any wish, Varuna Kumari, Vaaruni came out. To prevent the asuras from consuming the Amirtham,Lord Vishnu took the form of a beautiful Mohini. The asuras were distracted by Mohini thus enabling the Devas to consume the nectar that restored their strength and wealth. Hence this place has got its name ‘Thiru Moghur’ to mark the incarnation of Lord Vishnu as Mohini. Here Lord Vishnu is known as "Kaalamegha Perumal" (Kaala- dark, megam - clouds) meaning, like the one who brings rain to the parched land, the Lord bestows his blessings on those who seek him here.His consort here is Thayar Sri Mohanavalli.Lord Brahma worshipped Lord Vishnu on this sacred land as a mark of gratitude for safeguarding the sacred Vedas from the two demons Madhu and Kaitaba. The temple is surrounded by huge compound walls and outside the temple we can see the "Ksheeraapthi Pushkarani". On entering through the east gate entrance, we can find the "Kambatthadi Mandapam". In this mandapam, we can see stone carvings of beautiful statues of Chinna Marudhu and Periya Marudhu , who helped build this temple. Next is the Garuda Mandapam. In this mandapam, we can see the idols of Sri Kothanda Rama, Sita , Lakshmana, Kama devan, Rathi. There is a small sannadhi for Garudan after this mandapam. On the southern side, a separate sannadhi for the perumal is found where he gives his seva in Sayana thirukkolam (Sleeping posture) along with Sridevi and Bhoomi devi. The adishesan has thanga kavacham (Gold covering). The sannidhi for Chakrathalwar with sixteen arms holding fierce weapons is very famous here. He is found in Prathyaaletha posture that signifies the readiness to help devotees at all times. There are 154 alphabets carved in the six circles and there are pictures of forty eight gods carved. There is Lord Narasimha behind chakratalwar with sangu chakra.Sannidhis for Acharyas,Alwars, Sri Andal, Lord Krishna and Lord Anjaneya are found in the temple. 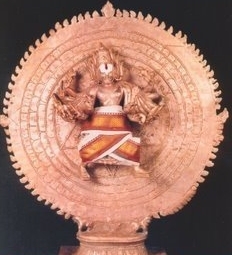 The Moolavar of this sthalam is Kaalamegha Perumal. The Moolavar is giving his seva in a nindra kolam (standing posture) facing east similar to Varadharaja perumal of Kanchipuram with gadha in left hand and right hand blessing the devotees. 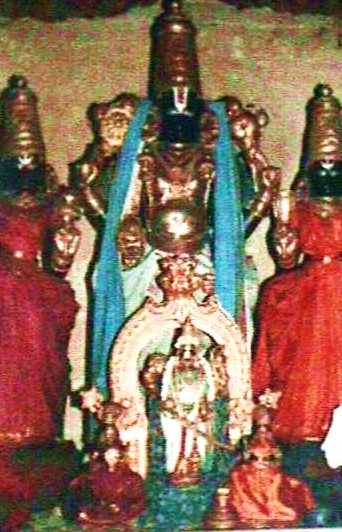 Prathyaksham for Brahmadevan, Indiran and Ajaruthar. Thayaar in this sthalam is is "Moghur Valli". She is also known as Mohana valli. She has a separate sannadhi. 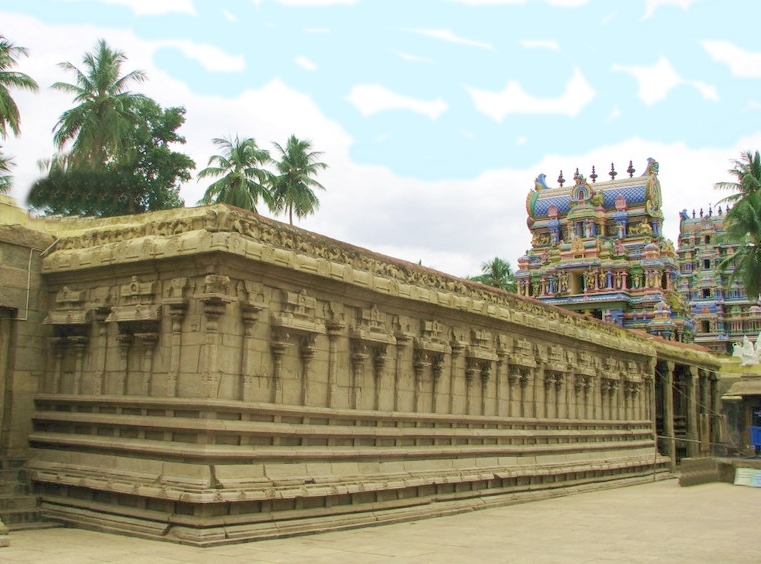 Temple location It is located around 14 kms from Madurai central point, the Railway station on the Madurai - Melur route. Where to Stay?There are many budget, semi-deluxe and deluxe hotels in Madurai. Other interesting places nearby Madurai Meenakshi temple, Alagarkoil, Pazhamuthir Cholai, Thiruparankunram,Thirumalai Nayak Palace, Vandiyur Mariamman.